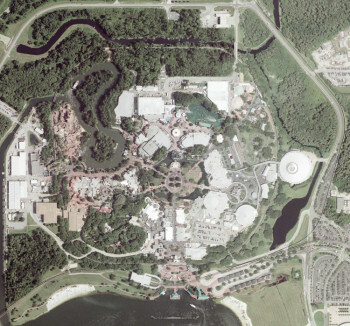 This picture is a satellite image of the Magic Kingdom. 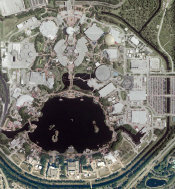 This picture is a satellite image of the Epcot which shows good detail in the buildings because of their size. Notice that in the bottom part of the shot the resolution changes so it has a bit of a blur to it. 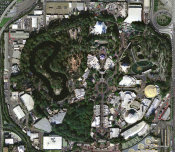 This picture is a satellite image of the Disneyland Park. Disneyland Park that really shows the detail. 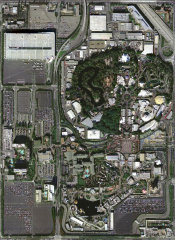 This satellite picture shows Disney's California Adventure with Tower of Terror under construction. This picture is a satellite image of the entire Disneyland Resort from about 700ft up. This picture covers nearly 1.31 sq. mi. 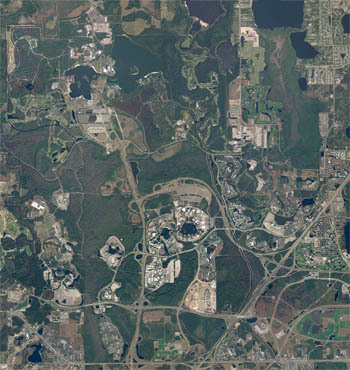 and was stitched together from 157 pictures. This image was also a 'Picture of the Week' on December 10, 2004.